Inside every frustrated journalist is an even more frustrated author, and self-publishing is an evil that many of us have succumbed to over the years. 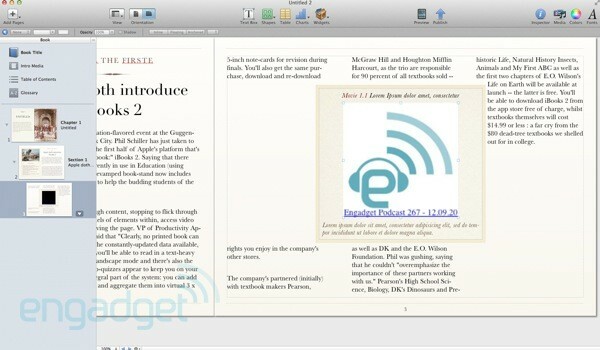 Still, much as we may want to resist it, we couldn't help ourselves when it came time to test Apple's iBooks Author app, designed for educators to push out textbooks to students for a fraction of the cost, time and energy it would traditionally take. So, how does it feel when you're working inside the software? Could you use it to prepare seminar materials for the class of 2015 or, more importantly, launch your own career as Stephanie Meyer's successor? Head past the break to find out! You open into a template-chooser that gives you six different options: Basic, Contemporary, Modern Type (retro-tastic), Classic, Editorial and Craft. You'll instantly notice that the designs scream out from the back of your memory -- you've seen books exactly like this throughout your education, each one packing detailed homages (or pastiches) from the originals. If you've used Apple's Pages (or Word, for that matter), you're going to find the setup here very familiar when inputting text. There's a lot of templates built-into each page, but you can tweak your text with the same level of freedom that you can in those other apps. Apple's attention to detail is at the fore here: the wonderfully observed front cover has shadowing like textured paper -- there's even white scratches in the dye, making this feel a lot more real than a pristine design. On the left-hand side of the main window is an outline of your book. 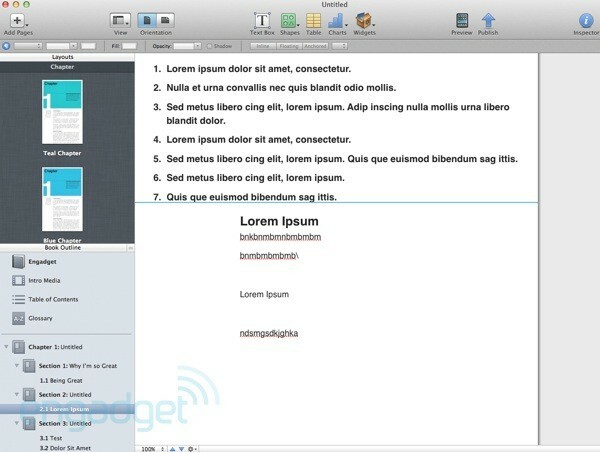 There you can add chapters based on various color templates and pre-designed sections. We noticed however, that there are four "Lorum Ipsum" sub-headers already in the text, no matter what we tried (in our admittedly quick hands-on) we couldn't replace any of them but the first with our own. It's a shame that we found ourselves butting heads with the software after such a short time, but it's not clear how you're meant to customize these pieces, if at all. One of the things we noticed is that you probably won't want to spend too much editing raw text in the app. This is certainly not going to replace your text editor of choice -- the templates are very fussy and require you to have everything ready before you commence. What does impress us is that every part of the layout is customizable. 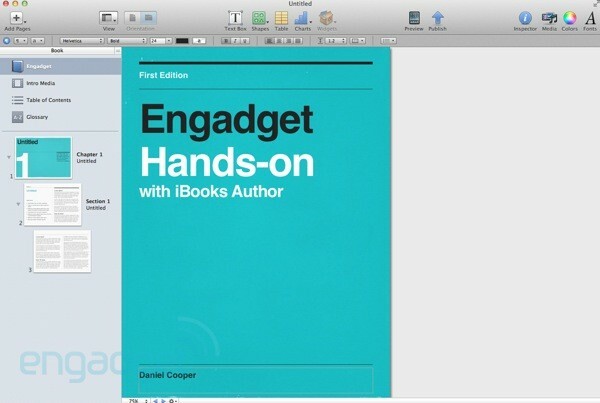 In this regard, it feels as if Apple's tried to anticipate most common tweaks that amateur textbook authors would want to make and provide for them. As you can see, it's also surprisingly easy to insert media into your plain text. Select the relevant widget from the above menu (you can also insert charts, tables, multiple-choice tests, galleries, keynote presentations and HTML) and a placeholder space will appear that you can dynamically move around your text -- here we unceremoniously plonked in an Engadget classic podcast that then shunted everything around and you can access from a tap. It's hard to convey how impressive this is: your average school teacher should have no trouble creating materials for pupils to a similar standard that a publishing house can. Whilst it's unlikely they'll have the resources to build out some of the (dare we say it) fancier options on offer here, we're excited to see that there is a lot of potential into this software that we have yet to see. 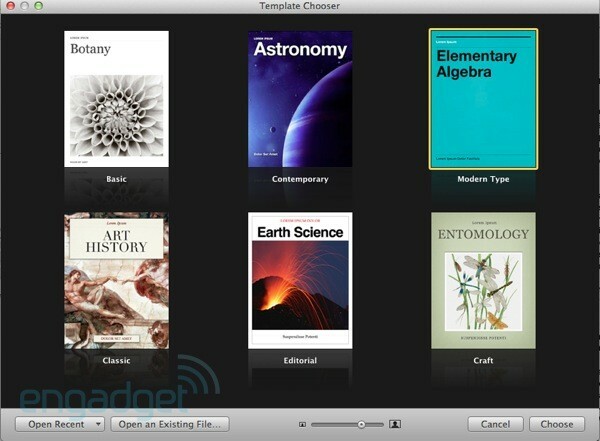 Apple confirmed to us that you can publish classroom materials for free and that each book will be approved in the same way that the App store approvals process works. Copyrighted works (if you utilize any) will have to be strictly cited and referenced in order to pass muster. You'll be able to publish books for free, all the way up to $14.99: with a fixed profit-share model of 70/30 between yourself and Cupertino. 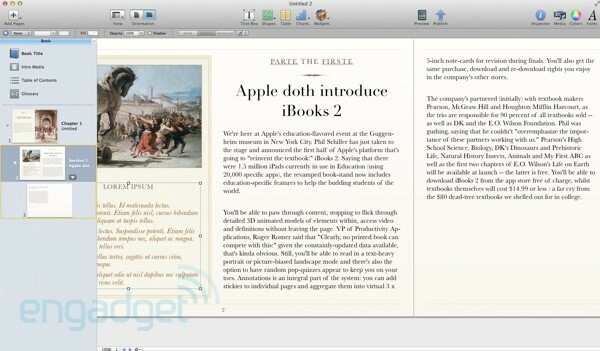 Most importantly of all, any book that you publish must be an exclusive to iBooks. Still, from what we've managed to achieve in our short-time with it, we're feeling pretty darn jealous about the learning materials the kids of tomorrow are going to get to play with -- as we nurse our back injuries from carrying around 20-ton copies of Herring's Criminal Law and Hudson's Equity and Trusts as a student.